Who came away from E3 2015 with the console crown? Who takes the gaming crown? 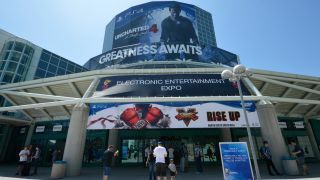 This year's E3 is all wrapped up, the glitz and glamour of the world's biggest gaming show is over and the votes have been cast. With Microsoft and Sony going toe-to-toe, and Nintendo sneaking in the back door, who has come away from LA with the E3 2015 crown? Well, Sony is my choice for "winner" of this year's E3 expo, but I think Nintendo is the company most deserving of a round of applause - or at the very least, a heartfelt hug and restorative cup of tea. It might have had by far the least memorable conference, with fans up in arms over the absence of certain games and franchises, but it also had to work the hardest for what little acclaim it managed to garner. The fabulous but underselling Wii U, after all, is at death's door - a successor, the NX, has been announced but isn't yet ready for reveal, which puts Nintendo in the painful position of shoring up an ailing platform while tacitly setting aside the pick of forthcoming games for a console it can't discuss. Hence its unexciting E3 software line-up, a parade of spin-offs led by the already known-about game editing suite Super Mario Maker and arcade shooter Star Fox Zero, bolstered by some diversionary theatrics on the part of company executives. Perhaps the fan reception would have been kinder had Nintendo gone first with its presser, rather than striding into the frenzy generated by some utterly bonkers announcements from the other two manufacturers. As things stood, it was like watching Mario play tennis against two tennis machines, armed with a string-less racket. Judged in isolation, however, Nintendo's E3 slate was pretty strong - more tangible, certainly, than Sony's fairytale show of vapourware brought back from the dead - and PR blunder-free save for the tactically misjudged announcement of a Metroid that isn't the much-rumoured Metroid Prime 4. Out in December, the new Starfox is the very definition of a nostalgic Christmas treat, modelled on the celebrated SNES and N64 titles and created in partnership with Platinum Games, a studio with few peers in the third-person action space. Super Mario Maker looks delightful for all its homely visuals, and is something of a triple triumph - a journey through Mario's glorious history, a workout for Wii U's under-utilised tablet controller and a love letter to wannabe designers of all ages. While hardly killer apps, these games show that Nintendo has its heart in the right place as the manufacturer prepares its new machine for the public eye. With Nintendo buying time for NX, it was left to Sony and Microsoft to deliver most of the drama this year. In a refreshing departure from the subtweet-level hostilities that characterise many E3s, this year's clash felt like a sparky double-act rather than a catfight - each company playing to its own strengths without really treading on the other's toes. The exception there is, of course, the shock announcement of local Xbox One backwards compatibility with Xbox 360 games, given publisher approval. It's not the kind of feature that wins console wars in itself - previous generations have shown that people are happy to hold onto their old consoles and games - but the impact on the battle of perceptions shouldn't be understated. Sony has done well over the past few years by presenting itself as best friend to the average gamer, with a cheaper yet more powerful machine and a library of great "free" games on PlayStation Plus. Now, it must pitch its own, pricey backwards compatibility program, the PlayStation Now streaming service, against a free solution that isn't affected by internet latency. Sony can take some consolation from the fact that Activision's Call of Duty franchise has switched sides, ending its long-standing symbolic DLC partnership with Xbox in order to bring Black Ops 3 maps to PS4 players first. That teeth-rattling backwards compatibility revelation aside, Microsoft's major reveals and promises were predictable but substantial: a blend of clever strategic overtures, such as the announcement of a Steam Early Access-style trials program for Xbox One, and accomplished-looking winter 2015 exclusives, livened up by a mind-bending show of the HoloLens headset in action. Bread-and-butter games like Halo 5, Forza 6 and Gears of War all put in appearances along with Rare Ltd's long-awaited new IP, Sea of Thieves, a multiplayer-centric pirate sim with naval battles that call to mind Assassin's Creed 4: Black Flag. In further evidence that the British developer has left its Kinect days far behind, this surfaced alongside an Xbox One compilation of classic Rare games such as Perfect Dark and Battletoads - all IPs we'd like to see more of in future. Microsoft also secured what is probably the conference's most important third party exclusive deal in the shape of support for Fallout 4 mods on Xbox One. Major Bethesda RPGs are once-in-a-generation affairs, and this one is impossibly full-featured - it's a game that lets you build your own town, for crying out loud. Those mods will eventually appear on Sony's flagship console, but according to Fallout 4's game director, Todd Howard, the timetable on that is 'fuzzy'. But none of that was enough to seriously challenge what is perhaps Sony's greatest E3 conference to date, an exercise in pure wish fulfilment that had the most jaded of observers wiping away tears of gratitude. It began with the first PS4 footage of The Last Guardian, a spiritual sequel to the acclaimed ICO and Shadow of the Colossus, which stars a lost child and an enormous yet endearing, wonderfully lifelike mythical creature. The game was announced for PS3 way back in 2009, and most fans of creator Fumito Ueda had given up hope of ever playing it - myself included. The Last Guardian's presence on stage made the conference a hit all by itself, but more was to follow. Square Enix's Final Fantasy VII remake, a game that's been in demand for the best part of two decades, will come first to PS4. There was no in-game footage and precious little detail, but the CGI trailer alone put the publisher's stock price through the ceiling. And then, perhaps most miraculously of all, Sony reached into its wizard's hat and pulled out a Kickstarter page for Yu Suzuki's Shenmue 3, successor to the Dreamcast's most treasured exclusive. Within a matter of hours fans had pledged over a million dollars, crippling the site's servers in the process (the majority of funds will be supplied by Sony and other backers). So grand and unexpected were these reveals that most of the Sony show's other big moments, such as live footage of Uncharted 4 and a new IP about hunting robot dinosaurs from Guerrilla Games, felt like warm-up acts rather than plausible GOTY candidates. The conference left us with plenty of unanswered questions, in fairness - whether The Last Guardian has really overcome its infamous development difficulties? When exactly Final Fantasy VII will launch given Square Enix's track record for delays? And how exactly PS4 owners will occupy themselves this winter, with few exclusive games on offer? But then, E3 conferences are about raw showmanship in the first instance, about selling a dream to millions of viewers worldwide rather than fielding enquiries from people on the ground, and this year Sony has put on a historic performance.